Juniper SRX has a great subset of SNMP Mibs for monitoring the device remotely. One of these is JUNIPER-IPSEC-FLOW-MON-MIB, which provides feedback on IKE Phase 1 and IPSec Phase 2 configured tunnels on the SRX. 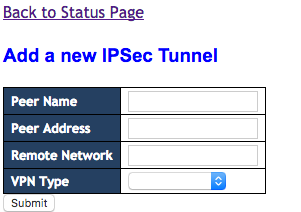 This saves having to login to the SRX to check the state of tunnels, and presents a nice Juniper SRX VPN monitor. There’s a script (updatedpeers.php) which pulls the currently working Phase 1 IKE associations from the SRX every 5 minutes using a cron script. This will update the MySQL database tables with the parsed output of OID (jnxIkeTunMonState, 1.3.6.1.4.1.2636.3.52.1.1.2.1.6). I did try using the jnxIpSecSaMonState OID, but unfortunately, this proved very unreliable for some reason, so instead I used the IKE (Phase 1) state which is both reliable, and should be there for a healthy security association anyway. The data from the MySQL tables is pulled using another PHP file (status.php), and displayed on the page, which refreshes every 60 seconds. We use a similar page I wrote at the company I work for which monitors the tunnels on multiple customer SRX firewalls.